I’m finally here, in the blogging world. After lots of encouragement from several people I’ve decided to take the plunge. Although I’m by not means a techno-phobe, I’m usually a little slow to embrace new technology. I tend toward the skills that have been around for a while…things like jewelry making, embroidery and tanning. But here I am, ready to take you a wild adventure that is what I create. 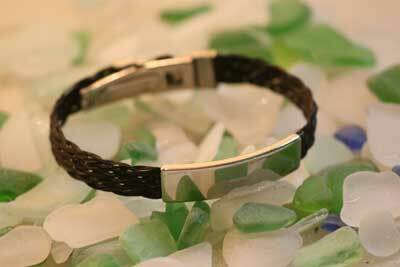 My main business products right now are jewelry, specifically horse hair jewelry and porcupine quill jewelry. I plan to have them up on my Etsy shop soon so you can buy something new and exciting. Plus I also create custom pieces. Click on the horse hair and porcupine quill tabs at the top of the page. For the horse hair jewelry, like this ID bracelet above, I use hair that a person sends me from their horse and create a very unique piece. It’s lot of fun for me and the people who get to wear always have a reminder of their horse around. This entry was posted in News and tagged horse hair, Jewelry, News, porcupine quills by Susan. Bookmark the permalink. hey. the site looks great! I love this bracelet and the photo. Thanks for the compliments! This photo and most of the photos on the horse hair page were taken by photographer Deborah Burnett Stauffer. She does an excellent job.